6" Length. 30 lbs Min. Tensile Strength. 1-1/4" Max Bundle Diam. 100/bag Oversea made Materials UL Approved, Nylon 6/6. 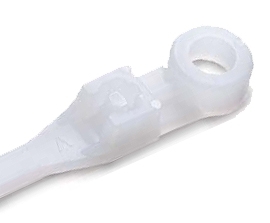 One piece design molded of fungus-inert, self extinguishing, white opaque virgin Nylon. Can be used in temperatures ranging from -40 degrees F to 185 degrees F. Bent tip allows the user to insert the tip and quickly into the self-locking head. Meets all Military Specifications.